The warm, salty broth, the sweet onions, the cheese… oh the cheese. To be perfectly honest, it was the cheese that first made me fall in love with this gooey delight of a soup. The soup itself was secondary. That is until I got a job at a cheese and wine bar and had their soup. Being a cheese shop and restaurant, the cheese on this soup was the best ever (layers of thinly sliced gruyere, a sprinkling of chives and parsley) but the soup itself really stood out to me. 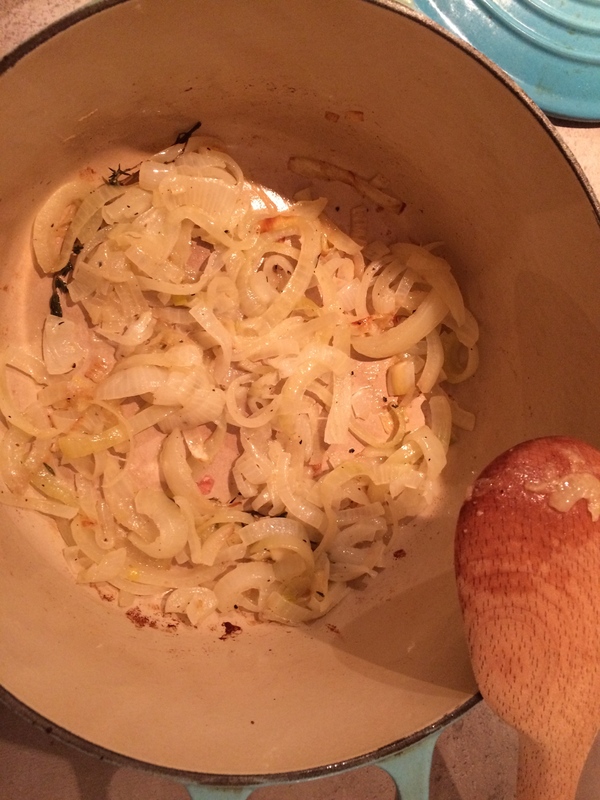 The broth was just so beefy and wine-like with just a hint of sweet from the onions. Of course, I set about trying to duplicate it. I’ve dried dozens of recipes and many tweaks of my own to get to this version that I think is the perfect onion soup. It isn’t overly sweet, like many are, and the broth has real clarity–no murky soup here. Each element sings on its own–excellent broth, succulent onions and salty oozing cheese. What I am about to share with you may not be conventional, but have some faith–this is the onion soup you’ve been waiting for. 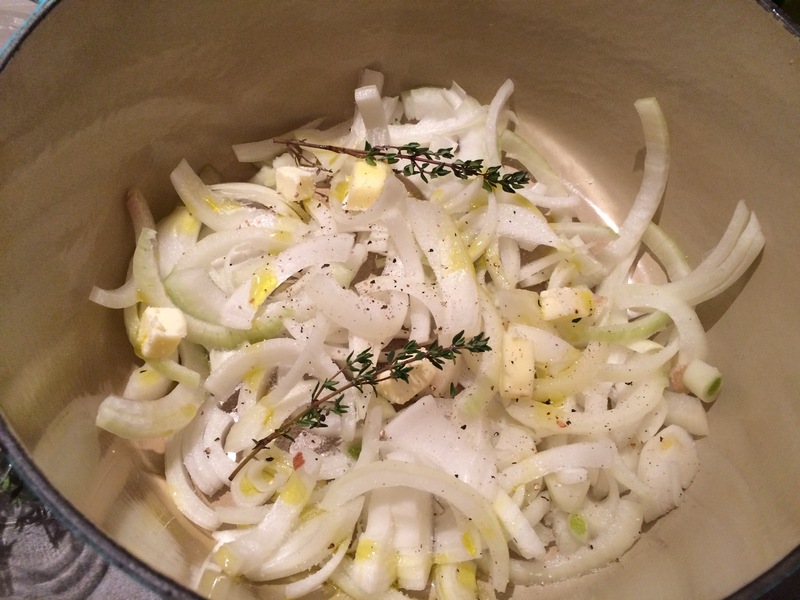 Here is my method (not really a recipe–I can be like one of those grandma’s from the old country sometimes when it comes to nailing down exact measurements) for onion soup. 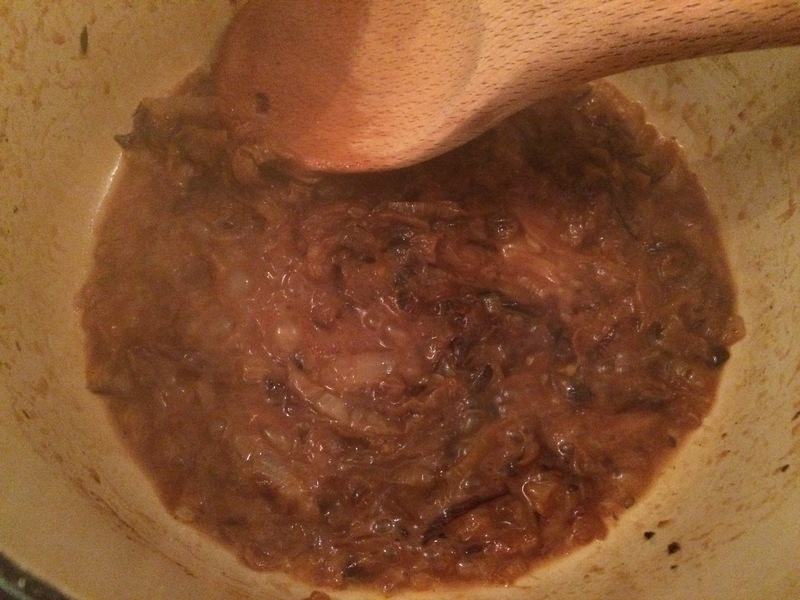 The onions need to get very, very caramelized and should be a mahogany brown by the time you add the broth. I do this in the oven. Slice all of the onions and put them in a pot with a tablespoon or so of butter, a few sprigs of thyme and salt and pepper. Cook for one hour at 400 degrees with the lid tightly on. After one hour, stir and put back in the oven with lid slightly ajar. Continue cooking for 1.5 to 1.75 hours more, stirring every 30 minutes to prevent burning. 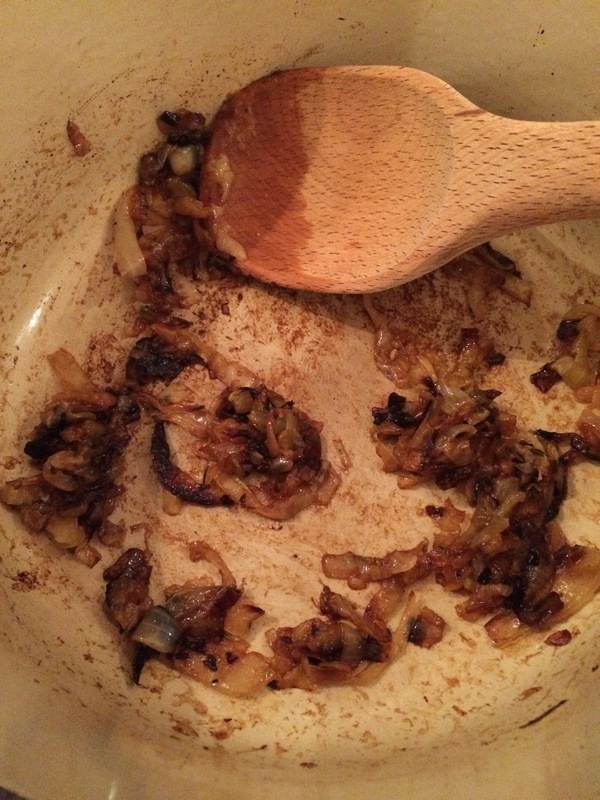 At the end of oven time –since I was only using a few onions, I had a few burnt bits. I just tossed them out, no big deal. Now you will take it out of the oven and put it on the stovetop over medium heat. Cook them a little more, 5-10 minutes, and remove thyme stems. Next, deglaze the pan with some beer. Let me explain why beer: I have tried red wine (too sweet), white wine (too weak) and vermouth (meh) but beer is what finally did it! 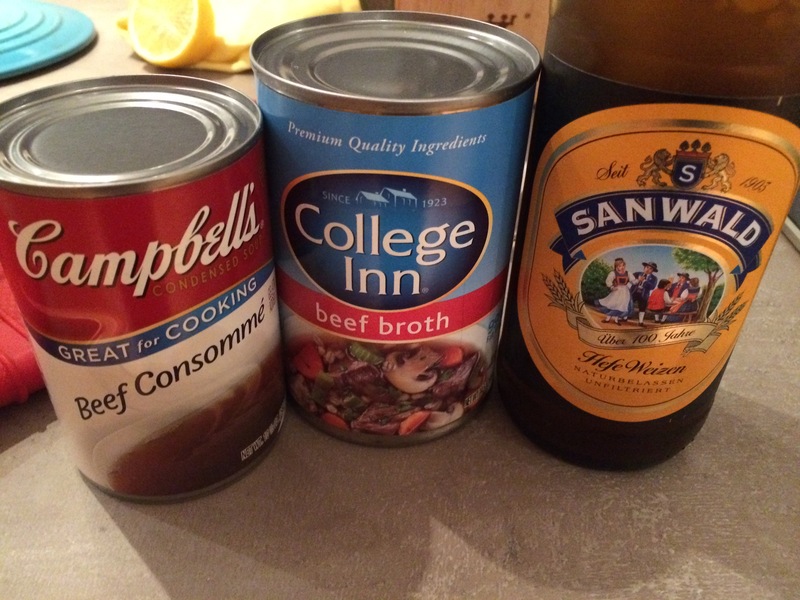 The finally soup will not taste like beer, but it will have that herbal richness and certain je ne sais quoi that you want from the alcohol addition. I know it isn’t traditional, but it’s the best in my humble opinion. Make sure to use a good quality light (in color) beer for this. I’ve found the best to be Erdinger Weissbier–but I’m lucky to live in a country known for its beer selection. After deglazing, let it cook off and more brown bits get on the bottom of the pan. Deglaze again. Repeat this 3-4 times. This is what it looked like right before adding the broth. After the final deglaze, add the broths and the bay leaf. Do not add salt, it’s probably plenty salty. Let simmer for 20 minutes. Before serving, taste for seasoning and add a dash of red wine vinegar for brightness. Top with toasted bread and melted cheese. Gruyere is best, Swiss works very well also. 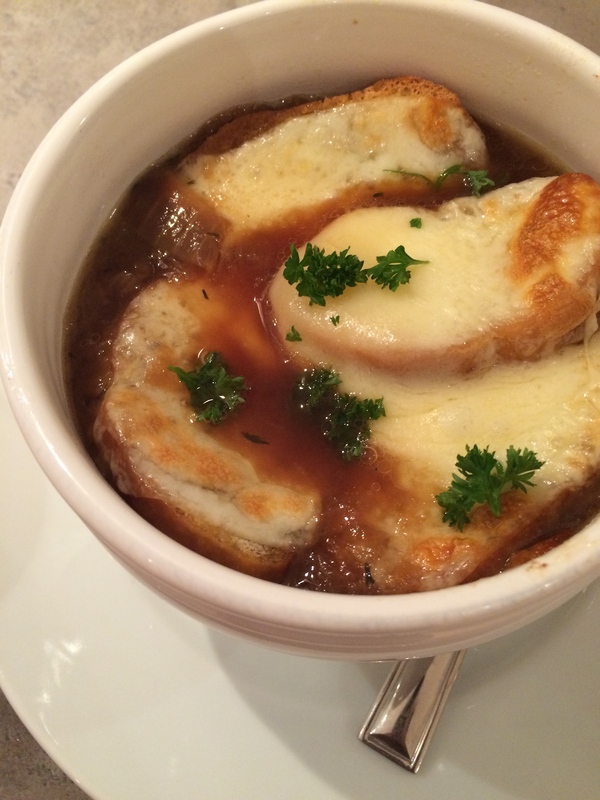 Enjoy the gooey, warm, comforting euphoria that is a good bowl of French onion soup. Sounds wonderful! Having worked at a cheese shop, perhaps you will know this-I purchased some Boar’s Head smoked gruyere, thinly sliced, and to my surprise, it would not melt! It just blistered and kept it’s shape. Strangest thing! Any idea why? That is strange! Gruyere is a great melting cheese, so that is odd behavior. My only guess would be that perhaps the heat was too high, especially since it was thinly sliced. Cheese prefers a lower temperature to melt. I usually melt my cheese around 350 and then turn on the broiler at the end for a little of the browning.